Roberto Mancini will hold his first press conference on Tuesday a day after being handed his “dream” job as Italy head coach with the task of reviving Azzurri fortunes six months after their shock failure to qualify for the World Cup. Mancini — former coach of Manchester City and Inter Milan — will meet the media for the first time as Italy boss at 12:00 (1000GMT) at the national team’s training centre at Coverciano near Florence. 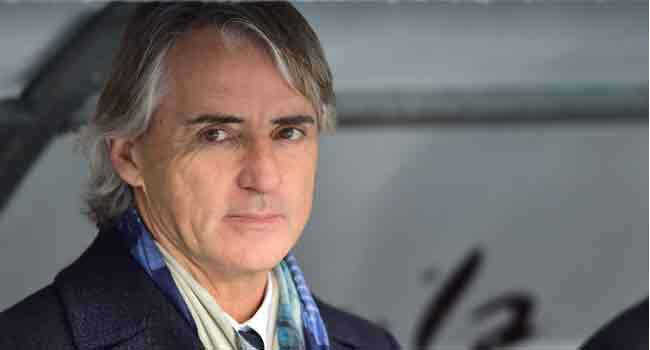 “Roberto is the new coach of Italy, it’s done,” Italian FA commissioner Roberto Fabbricini declared after Mancini signed his new deal in Rome on Monday night. “There is satisfaction, also on the part of Mancini – his enthusiasm was decisive in the choice. The two-year contract reportedly worth two million euros ($2.3 million) a year will see Mancini lead Italy to Euro 2020 with the option to extend until June 2022 before the World Cup in Qatar. The names of former Bayern Munich coach Carlo Ancelotti and Chelsea boss Antonio Conte had also been touted, with Ancelotti reported to have said “no”. He will give up a reported 13 million euros in wages over the two remaining years on his Zenit contract to do national service. After his three-year contract with the Russian club was officially terminated by mutual consent on Sunday, Mancini flew immediately to Rome on Monday morning declaring at the airport he was “happy to be back in Italy”. He signed his new deal later in the day. “It went the way we wanted, we are happy and Roberto is happy,” Fabbricini told journalists. He will also prepare Italy for a friendly against France on June 1 in Turin which could be the final international game for goalkeeping legend Gianluigi Buffon. In Mancini, Italy have a coach with a solid track record as a title-winner with 13 trophies in club football. He led Manchester City to their first English league title in 44 years in 2012, and won three Serie A titles with Inter Milan. He also won Italian Cups with Inter, Fiorentina and Lazio. Since leaving England in 2013, Mancini also managed Galatasaray, who he lead to a Turkish Cup title, and Inter Milan before joining Zenit in June 2017. He never became a regular with Italy having a love-hate relationship with the national side during his 10-year international career, during which he won 36 caps and scored four goals.